The Ultimate Sotong Guide 2018 is now complete! The essential information you need to prepare for London life, all condensed into one ultimate guidebook proudly produced by ICSS. 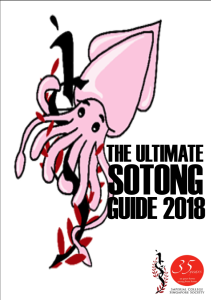 Download the complete Ultimate Sotong Guide 2018 here! 1. Ready? – Pre-departure administrative details. Congratulations! You’ve accepted your offer to study at Imperial College London. Yay! Now what? With so much administration to complete, even the most experienced sotong will feel flustered. Don’t worry, here we take you through step by step on pre-departure administrative details, from VISA application to NS exit permit. Now that you’ve had all the important admin settled, we’ll go through the accommodation application processes and options for both undergraduates and post graduate students. We’ll run through a packing list of sorts that will hopefully give you a better of what you’ll need to bring and hopefully soothe your inner kiasu tendency to pack your whole room! It’s all about helping you to settle into London, from opening a bank account to cost of transport and living. Hopefully this will give you more information when preparing the last few pieces of documents needed before heading to London. More information is also provided about the other events organised by ICSS throughout the year.